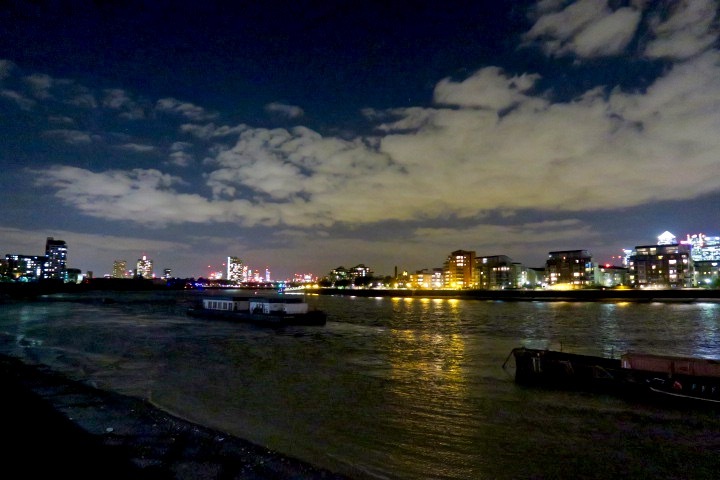 The Sail Loft is tucked away just moments from Cutty Sark and offers incredible views of the Thames with floor to ceiling windows. Previously I had associated Fullers with pubs, but The Sail Loft offers an upmarket setting with just as welcoming an atmosphere as you would expect from your local boozer. Paying homage to the area’s Maritime history, The Sail Loft is tastefully decorated with boats, ropes and sailing paraphernalia. Though I barely noticed the decor until later in the evening as I could not take my eyes off the stunning sunset that surrounded us. 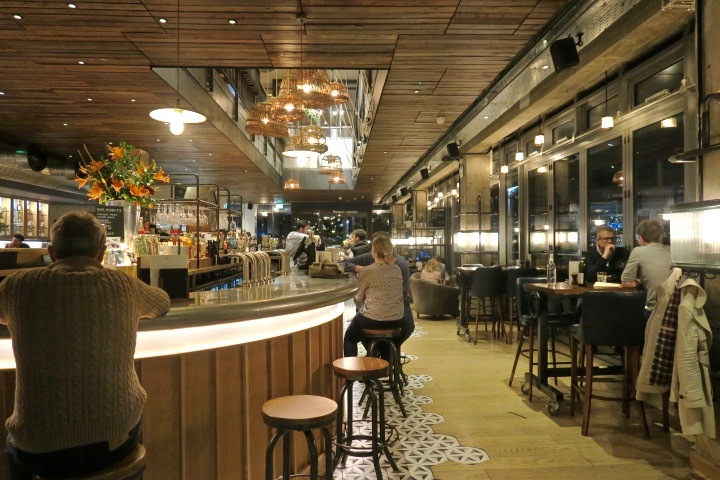 It is not only the decor and location that makes The Sail Loft stand out from your average pub chain restaurant, but it is also part of Fuller’s Kitchen which spans 100 pubs across the country. 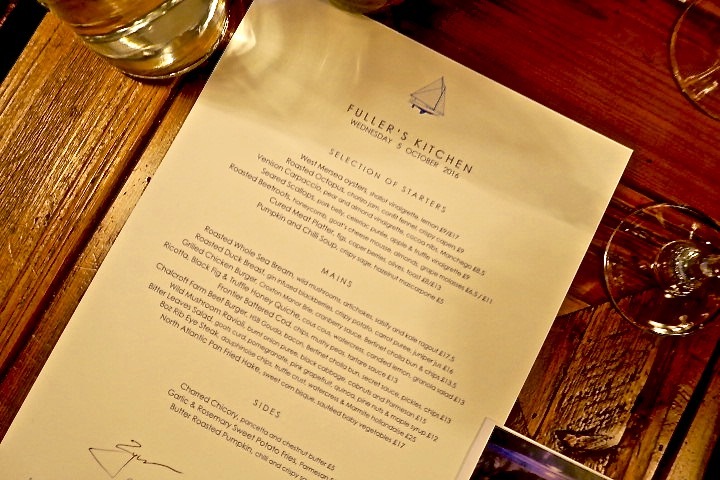 The Fuller’s Kitchen strives to provide high quality drinking and dining in stunning locations. We were introduced to the brewers take on dining by Head of Food, Paul Dickinson, who enthusiastically told us that each Fuller’s Kitchen creates its own menus for each location, with signature dishes devised by the in house teams that are always cooked from scratch, providing restaurant quality meals in a comfortable setting. 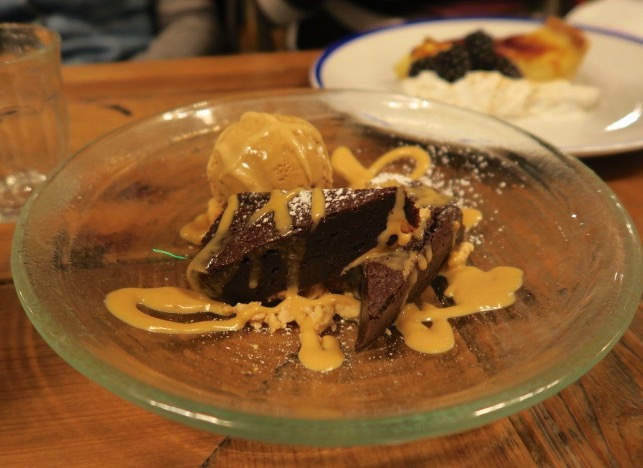 Though the menus vary from location to location they all stick with homely gastro pub roots whilst allowing their chefs to get creative in the kitchen. After hearing so much about the food I was desperate to get stuck in. The starters were brought out all at once, allowing us to sample a little bit of everything. 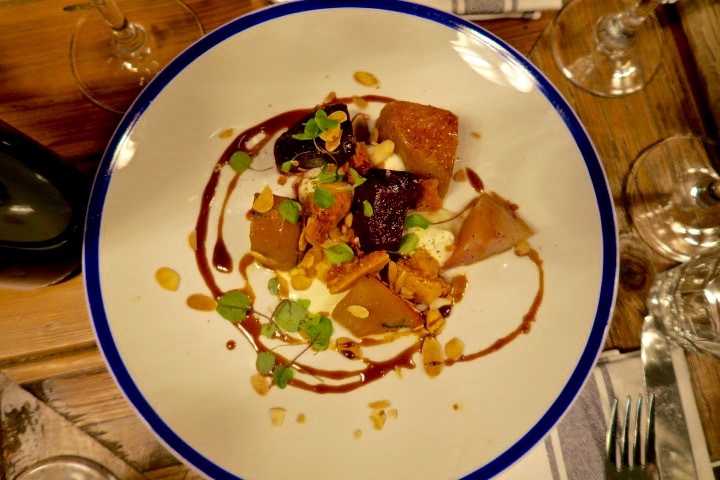 There was only one vegetarian option on the table but the plate of roasted beetroot served with sweet honeycomb, goats cheese moose, almonds and grape molasses held its own with an incredible mix of flavours. 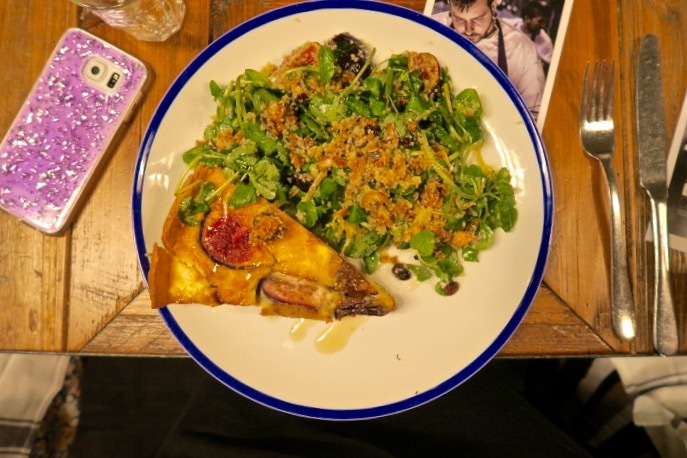 For my main course I selected the Ricotta, Black Fig & Truffle Honey Quiche, served with cous cous, watercress, candied lemon, granola salad. The quiche itself was creamy, packed with vegetables and surrounded by a sturdy crisp pastry. 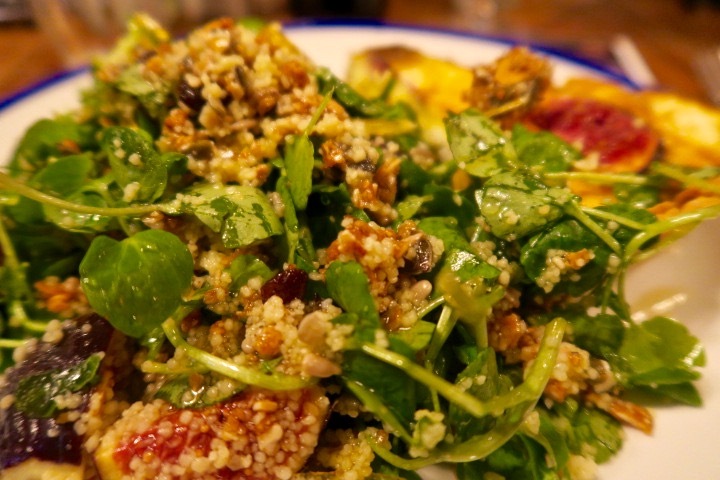 The side salad was generous but I personally found the citrus flavours were overpowering for my particular taste. On the side my always fabulous date for the night, Erica, and I shared Butter Roasted Pumpkin, and Garlic & Rosemary Sweet Potato. 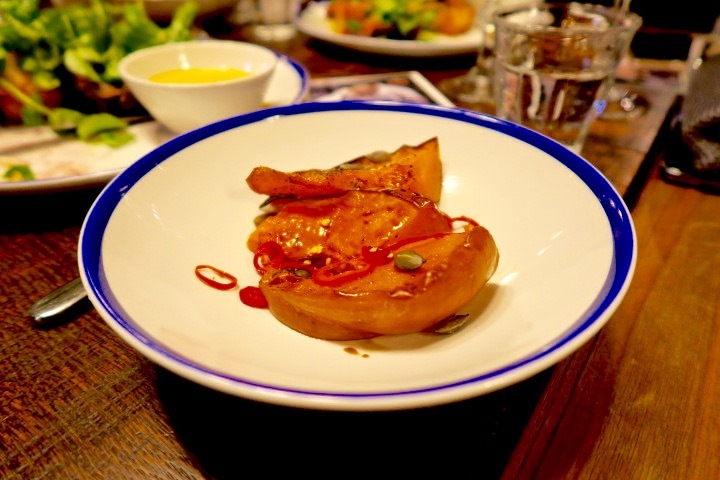 The pumpkin was wonderfully festive and was perfectly complimented by the sage and chilli seasoning, and the fries were crisp, salty and extremely morish. 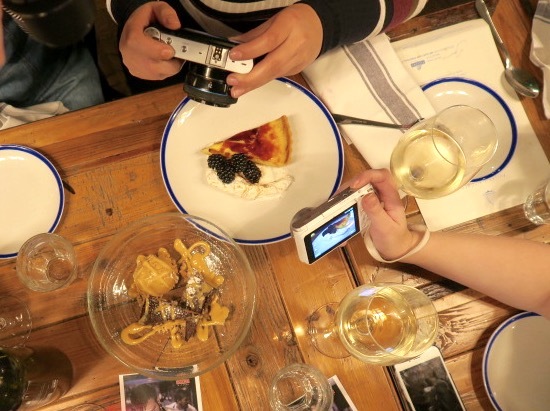 The deserts, like the starters, were served together allowing the table to share and discuss our favourites. I am not a desert person however the salted caramel ice cream is some of the best I have ever eaten, it was decently creamy and had the perfect balance of both sweet and savoury. This came accompanied by a perfectly warm, oozing, rich brownie which made a delicious pairing. The other desert that seemed to get rave reviews by the rest of the table was the Baked Alaska, with poached peaches & raspberries which was a modern take on this 70’s classic. The Sail Loft is in a wonderful location with a selection of food to match, it takes the idea of pub grub to the next level without losing its comfort factor.